My first post is about abbeys. What is an abbey and what does it represent? Abbeys are a complex of buildings centred around a church devoted to a religious order and governed by an abbot or abbess, so they are synonymous with the establishment of monasteries and convents. An abbey is a home, a work place and a self-contained community. The first abbey in Europe was established at Monte Cassino by Benedict of Nursia in 529AD (sadly badly damaged by bombing 1944 before being rebuilt). By 1415, over fifteen thousand Benedictine monasteries had been established. Each monastery was built using a blue print based on the Roman villa and contains the same buildings: church, cloisters, refectory and dormitory. This layout adapted to local situations, but essentially remain the same. As abbeys grew in size and importance, infirmaries and guest facilities were added, and within the abbey church (or monastic cathedral), chapels with altars arranged around the nave and apse were encouraged to enable monks to become priests with their own little chapel. What started out as a small church became an immense construction. By late Medieval period, monasteries and convents were often wealthy businesses with lots of land and lay workers who lived alongside the monks and nuns. Religious orders split and diversified but in essence abbeys remained the same whether they existed in cities, towns or the middle of nowhere. However, they weren’t owned necessarily by the order who lived within their walls. Abbeys were mainly founded by wealthy patrons who were keen on displaying their piety. So though an abbey might begin under one order, over the centuries it would ‘change hands’ becoming a different order or even become a convent inhabited by nuns. By the time Henry VIII took control of the church in England, abbeys were some of the richest communities in the country. Henry dissolved them, believing them to be corrupted by greed and power. Naturally, he took that wealth for himself. As for the abbeys, what became of them? Those monks and abbots who resisted and refused to swear oaths to the new head of the church, were killed, their monasteries destroyed. Many abbeys were robbed of stone down to the ground, rather like castles in the civil war. Those that survived either became parish churches, a few became city cathedrals and others were turned into private homes, for example, Anglesey Abbey, which is not on Anglesey but in East Anglia. I’ll be focusing my exploration on abbeys as buildings, especially the churches. The ruined ones and the intact. Over the centuries, as persecution of Catholics lessened, some abbeys came back to life. They were rebuilt and repopulated. Tomorrow, I’ll tell you about Buckfast, a working monastery that was reborn in the 19th century. Fascinating stuff. I’ve never really stopped thinking what the history of abbeys may be, though I have of course studied a part of it when I was in school. It sounds like a fascinating journey, like the one around castle last year. I hope you enjoy it. I’ve plenty more posts to write! Great introduction, looking forward to more posts around this theme, Buckfast has quite a reputation, especially where I am from in Glasgow… Hope you get the chance to check out my effort too. Best of luck for the rest of the month. I guess it probably has! I’ll be concentrating on its history. This was really interesting… thanks! 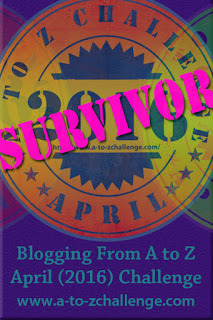 Good luck with the A to Z Challenge! Thank you. Good luck too. Very informative! I love being taught something, especially anything related to history — so thanks for that! Good luck with the rest of the challenge. I hope you find the rest of the challenge as interesting. Like castles, it’s fascinating to look at a ruined abbey and imagine how it was once absolutely central to its community. Great post! Looking forward to more. So many abbeys are ruined sadly and leave only a trace of their history. I always love a good abbey. I’ve been to some lovely ruins and some still surviving in Ireland and Britain. There are a few survivors in this country, but not in their original glory. I love the ruins too. I look forward to you calling by. What a great start. I’m going to find this very interesting. I live close to Battle Abbey, built on the site of the Battle of Hastings in 1066. As well as a tourist attraction, it has a prestigious private school within its confines. See you Monday! I shall look that one up. See you Monday, too! Hello, fellow A-to-Zer! Abbeys! This is awesome! I will certainly stop by again! I was especially pleased to see the typical layout of an abbey. Thanks! I’ve got a few more layouts to share. Great post! I love learning stuff like this. I never really knew what an abbey was. Know I know. I didn’t realise how complicated the history of monasteries was until I started to research. I did not know all the histroy about abbeys, thank you for all the info. Great post. I do love visiting abbeys around the country – the last one I went to, I think, was one of the ones in Yorkshire. I’ve a couple of Yorkshire ones to mention. They took decades to build, so I think there was a lot of patience. The land given to the abbey would have brought in rent from tenants, another way of raising money.